Ready to Learn to Row? Adult (Masters) Learn to Row Session with Coach Ted Swinford! Would you like to try rowing without a commitment? If you are interested in trying the sport of rowing and beginning your journey to better health than join us on April 30th & May 2 – 4th or May 28, 30, 31 & June 1st. Practices are from 6 – 7:30 PM on weekdays and then 6:30 – 8:30 AM on Saturdays. We invite you to join us and experience all that rowing has to offer. The thrill of a great workout, the tranquility of being “out on the water” and the camaraderie of being part of a team. The cost for the Learn to Row Program is only $150! After you complete these sessions we are pretty certain you will be hooked. If that is the case, there will be the opportunity to enroll in a three-day-per-week skill-building program that will run through July. 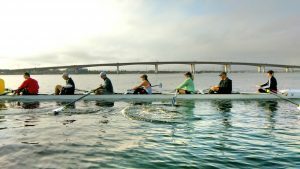 The total cost for the Learn-To Row and the Skill-Building Program is only $400. We are located at 201 City Island Parkway, Daytona Beach (behind Jackie Robinson Stadium/next to the Volusia County Courthouse). Comfortable workout clothes appropriate for the weather. Nothing too loose fitting and layers work best (you’ll work up a sweat!). Athletic shoes/socks a must. Refillable water bottle. And most important, a great attitude and willingness to learn and have fun! Course payments accepted by check or credit card (onsite).